Or park yourself in the hot tub until you can feel your toes again. Tell stories, play board games or make a dent in that 1,500-piece puzzle - it's all about just being together. That cinnamony-sausage french toast bake? Bring it on. The sunny fitness room is inspiring enough to get you to stay longer. 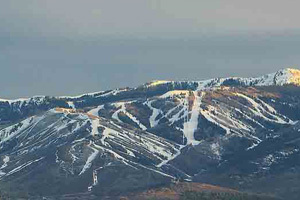 Walk to Park City Mountain Resort in 4 minutes – and Jenni's Trail Lift in 6. Posh Main Street, Park City, is a mile away. Stay on the inside part of the indoor/outdoor pool, or go for the full arctic effect. Whether you choose the indoor or outdoor hot tub, your weary muscles will thank you. Get up close and personal with the mountains on the Round Valley trails, about 3 miles away. Book a tee-time bright and early at Park City Golf Club (a 4 minute walk), so you have the rest of the day for hiking/biking. Inextricably linked with local mining history due to its location on Park City’s historic silver mine site – Silver King is right at the base, just steps from the PayDay Lift. Inside the lodge, hundreds of authentic artifacts and photos are displayed in the halls and common areas, offering a time capsule of what life around here was like pre-ski-boom (not nearly so posh, that’s for sure). Speaking of posh, heated underground parking keeps you from having to dig your car out from piles of snow, and complimentary ski lockers let you stash all those hats, gloves and googles so your villa stays tidier. A steamy heated indoor/outdoor pool lets your little polar bears swim out into the brisk mountain air while you stay inside where it’s warmer (win-win). There’s a fitness center should you feel exceptionally motivated after a day on the slopes or trails, and the game room keeps the kids blissfully happy with a pool table and arcade games while you get dinner in the works. If you’re up for venturing out in the evening, Park City’s lively historic Main Street is close by. Go early and browse the boutiques and galleries until it’s time to follow the hostess to the table you reserved for dinner. Individually decorated condominiums are available in a variety of floor plans, from studios to one- and two-bedrooms (both with a hot tub option). Even if you don’t splurge on the in-unit hot tub, most rooms do have jetted bathtubs, and there’s a roomy hot tub in the indoor pool area that’s perfect for an after-dinner outing. Full-size kitchens call for full-size dinners. Plan ahead so you have what you need to dish up your greatest hits. The wood-burning fireplace makes the living area extra-cozy – but may also make you feel extra-drowsy after a big day on the mountain. Plan on turning in not too-too late, so you’re up and at ‘em bright and early the next morning. In addition to having easy access to 426 downhill trails, you’re steps from the Park City Municipal Golf Course, which cleverly doubles as cross-country ski territory once the snow hits. This whole area is a mountain biker’s paradise, so when in Park City, do as the Park City-ers do. Rent knobby-tired two-wheelers for your crew and hit the Rail Trail for spectacular mountain views, the 20-mile Mid-Mountain Trail which crosses through three ski areas – or Wasatch Crest Trail, a smooth single track you can take at top speeds. Every Sunday throughout the summer, the Park Silly market fills the streets with live music, local craftsmen and amazing food. The annual (always sold-out) Savor the Summer outdoor dinner party takes over the historic Park City Main Street with a 1,500-seat table. And for arts lovers, there’s the Deer Valley Music Festal, Kimball Arts Festival – and the star-studded Sundance Film Festival. - Front desk is open 8:00 AM-7:00 PM daily. Guests that are planning to arrive after hours must contact the property using information on the booking confirmation to receive check-in instructions.